Exiting Lake Albert, the river flows north into Sudan and is known as the Bahr el Jebel. 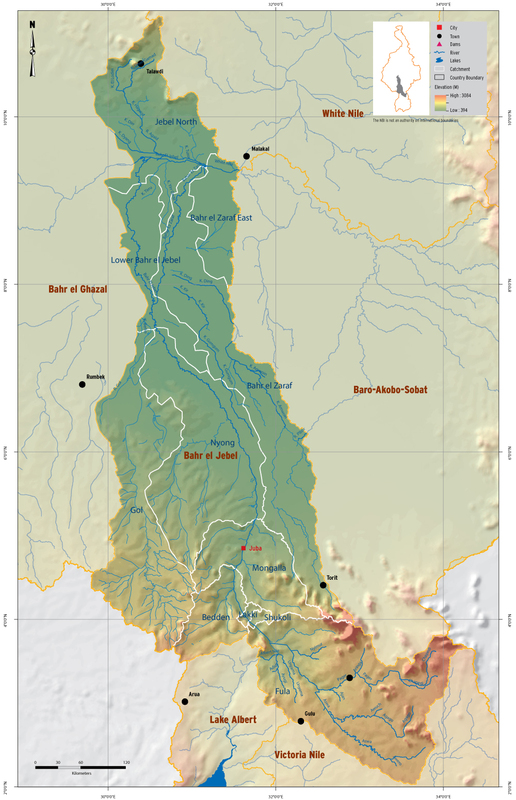 The Bahr El Jebel Sub-basin is the most complex of the Nile reaches due to having many seasonal inflows. Below the Sudan-Uganda border, the river receives seasonal flow from torrential streams before entering the Sudd, south of Mongalla. The Sudd is a region of permanent swamps and seasonal wetlands, within which approximately half of the Bahr el Jebel flow is lost to evaporation. The average precipitation over the area is 1067 mm and the average annual potential evapotranspiration is 1,694 mm. Rainfall intensity decreases to the north where the annual average does not exceed 760 mm. Precipitation falls mostly in one season from April to October. This coincides roughly with the river flood period when the area is permanently flooded. Swamps expand in proportion to the magnitude of the inflow from the Mongalla and from local precipitation.